Whether you are an employee, a stay-at-home parent, a student, or any combination of the three, it is easy to get caught up in the craziness of your daily activities. When this happens, lunch usually becomes an afterthought and you wind up eating a hastily cobbled together plate of whatever was left in the refrigerator. Fortunately, there is a way to prevent this chaotic type of meal and start the second half of your day off the right way. 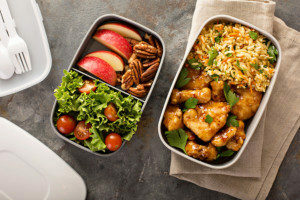 We have combined the philosophy behind Meal Prep Sunday with a love of easy recipes and the convenience of Kangovou bento lunch boxes to bring you the perfect bento lunch box ideas. No matter how busy your week is or how you structure your diet, these recipes will ensure that you never miss another lunch. Nothing is better than good old-fashioned comfort food, and this dish, similar to a chicken casserole, is no exception. This chicken tetrazzini is packed with chicken, cheese, and pasta, and tastes like a small slice of heaven. However, the best part of this dish is that it is incredibly easy to use as a meal prep staple. It can be made in large batches that can be portioned into freezer-safe bento lunch boxes and stored in your freezer for months. After two minutes in the microwave, it tastes just as good as it does when it is fresh out of the oven. This Louisiana surf and turf classic is easy to prepare and features a balance of carbohydrates and protein that is guaranteed to keep you full all day. 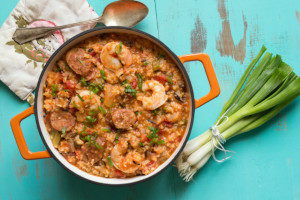 As an added bonus, you can disguise some veggies in this jambalaya that even the pickiest eaters will never be able to detect. Simply purée the green peppers and tomato chunks into the sauce instead of slicing them! This four-ingredient pulled pork recipe can be doubled in a large crock pot and frozen in a bento lunch box for later in the week, and can be enjoyed either on a gluten free roll or right out of the pot. It is also one of the simplest dishes in terms of execution; just place the pork into the crock pot and pour the bouillon and water combination over it and let your slow cooker do all of the work for you! These fancy deviled eggs are perfect for those days when you cannot find the time to sit down and enjoy a meal. With a shelf life of up to four days after preparation, an unbelievably short prep time of ten minutes, and the protein equivalent of eating a three-egg omelet, bacon blue cheese deviled eggs will give you the energy boost you need to finish your day strong. These eggs are also incredibly efficient – making and eating them only requires a small portion of your valuable time. There are only five wholesome ingredients in this no-bake homemade granola bars, and the sweet taste comes from honey and dates instead of processed sugar. This particular recipe is customizable to fit vegan and gluten free diets and can be cut to fit perfectly in one of the compartments of your bento lunch box. Your granola bars can be used as an on-the-go breakfast, as a snack, or as a side for your favorite meal. 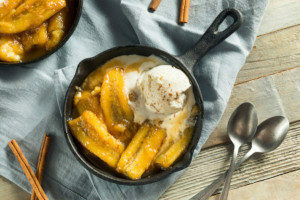 Many restaurants feature bananas foster on their dessert menus, and now you can too! This recipe is perfect for a Friday treat and can be made in minutes. Whether you serve it over pancakes, waffles, or ice cream, this is a guaranteed way to make sure you and your family fit at least one serving of fruit into your day. These bananas are as easy to love and easy to prepare—all you need are bananas, brown sugar, butter, and a skillet. When you finish cooking them, simply transfer the bananas into an insulated bento bowl and pour them on top of your choice of breakfast carbs. Using a bento lunch box to meal prep is the best way to store and serve lunch while feeling confident that you and your family are eating out of the safest possible containers. Kangovou’s bento lunch boxes are completely free of BPA and other harmful chemicals in addition to being dishwasher-safe and appropriate for all ages. To learn more about bento lunch box ideas, or to purchase a bento lunch box, contact Kangovou or shop online today.